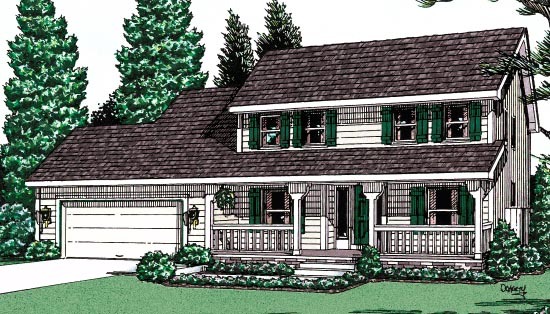 A covered porch that is both fun and practical graces this plan’s façade. 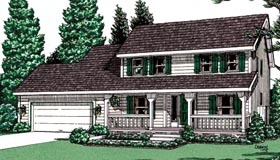 Upon entering this home, your guests are treated to a formal dining room at the left, and a snug parlor to the right. A spacious breakfast room lies beside the kitchen, featuring a built-in snack bar for meals on the go. A fireplace warms the back corner family room, which has twin windows for a look at the backyard scenery. For maximum privacy, the second-floor master bedroom occupies an entire wing, and leads through a deluxe five-piece bath to a handy walk-in closet. A bonus room atop the garage adds 123 square feet. This home is designed with a basement foundation.